If you are thinking about moving to the Adirondacks, please consider the extreme weather in your proverbial list of pros and cons. I've been accused of having a love affair with the Adirondacks, which I will get to later, but I think I've been honest about the drawbacks of Adirondack life. While, it is true I love living here, the very things that make Adirondack living enjoyable can also be considered a drawback, depending on your mood and the season. The sub-arctic temperatures for example, are appealing to people like me who place a high value on the having the ability to ski from the front porch. But, for an early season road cyclist, this morning's 24-degree ride must have been a brisk one. To be sure, April is one of the worst weather challenged months in the Adirondacks. As you can see in today's view from home, we had a skiff of snow last night and the clouds blew out early in the day leaving us with another cold, crisp Adirondack blue day. If you think you can brave our weather, like 24 degrees and snow in mid-April, and are considering buying a piece of the Adirondacks, contact me since I am a real estate agent in Lake Placid, New York. As a matter of fact, here's a hot real estate tip I heard from an old timer: this spring and summer are going to be "hot." I think that means the market is going to pick up, so you'd better email me right away. Now about my love affair with the Adirondacks. 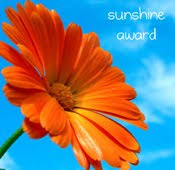 That is how Mary Ann over at the Starlight Blog described my blog, Adirondack Lifestyle when she gave me a Sunshine Blog Award. 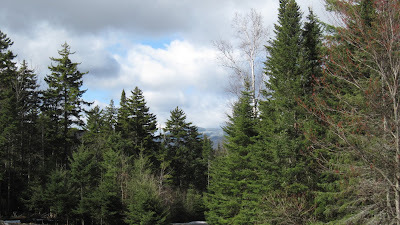 "Joann of Adirondack Lifestyle Blog is like a love letter to the Adirondacks. Joann is up in the high peaks district of Lake Placid, which we don’t get to nearly as much as we’d like. When she’s not writing about the Adirondacks, she’s selling real estate in and around “America’s Best Outdoor Town.”"
Yes, me, little miss sunshine herself got a shout out. Thank you. When I read about my blog award I was reminded I am also a real estate agent, which explains today's real estate commercial, for which you have Mary Ann at the Starlight Blog to thank.